Last night, I was reading Bible stories with Henry. And he's been very inquisitive lately, asking if all of these things "really happened." Oh sigh. We're at the very beginning of the Old Testament, so you know, it's not so cut and dry. He's only 7, but he already knows that Santa Claus and the Easter Bunny aren't real, and I've always wanted him to know that God is not just a mythical character that we've invented for his entertainment. God is *real*. This is all complicated, however, by the fact that Mike doesn't believe in God (although he's a baptized and confirmed Catholic, so I truly believe that those sacramental graces are still at work :)). He's very good about not talking to Henry about this, because he doesn't want to undermine my efforts in raising the children Catholic, which I appreciate greatly. But Henry knows that Mike doesn't always come to church with us, and so already this whole God thing is coming only from me and thus holds less sway. And so I resolved long ago that I would answer honestly any question that my kids asked me about our faith. I don't want them to feel like their normal doubts and spiritual struggles weren't taken seriously or that they were not told the truth. To my mind, this makes our faith (hopefully) more appealing to them. Because in the end, they have to *choose* to continue to practice their faith once they no longer live in my house. If they don't choose that, there isn't much I can do about it then except pray for them. But NOW, now I can try to form them in the faith such that they *want* to make it their own and keep it with them throughout their whole lives. This is my goal. Where is this going, Tiffany? I'm getting there, I'm getting there. :) This is how my posts always start out, you know that by now. So, last night I was getting the questions again, and I told him that some of the stories in the Old Testament are used by God to show us something. They may not have happened historically exactly as portrayed, but God is trying to teach us things by the story. Well, this didn't go over very well. :) If it didn't actually happen exactly as written, then he finds it much less compelling. When I left his room to go back downstairs I felt very unsettled. Had I used poor judgment in my explanation of the Bible stories? To be honest, I don't know the answer to that question. It's the curse of your first child, they are the recipient of all of your mistakes. But before we could start the next episode of Breaking Bad (snort!) I tearily told Mike of my fears that I'm failing in my efforts as a Catholic mother. And this is where Mike's wonderfulness comes into play. He isn't a practicing Catholic, but he is SO supportive of my faith, and I find it very easy to talk to him about religious matters. 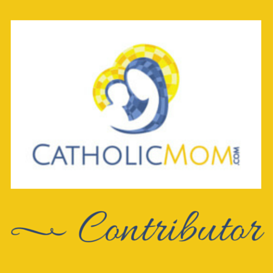 As you might expect, with Catholicism being such a huge part of my identity, I want to talk about it A LOT. He soothed me and made some suggestions. As we were talking, the thought crossed my mind that yesterday was the feast of St. Monica. We all know about how she prayed for years and years for her son Augustine to find faith in God (and end his carousing ways, but luckily we don't have to worry about that just yet :)). This morning on the reference desk, I toted my new handbook of sacramentals to find an idea for the next Catholic Nook post. In between student textbook questions (ha!) I prayed Morning Prayer for the feast of St. Augustine, then prayed for God to guide me, and opened the book randomly to a page. It was for the Augustinian Rosary. To me, this was NOT a coincidence. No way. This book is nearly 350 pages long and I just happened to open up to the devotion ascribed to Sts. Monica and Augustine? Don't think so. Ok, so *finally*, what the heck is this devotion to Our Mother of Consolation? According to tradition, St. Monica frequently asked for the intercession of Our Lady in her years of desperate prayer for Augustine. Quick tangent: I hope he realizes how much his mother suffered on his behalf. *eyes narrow* I think of this often whenever I see children, even when they're adults, doing anything ill advised or dangerous: "ARE YOU *NOT* THINKING ABOUT HOW YOUR MOTHER WILL WORRY?! CLEARLY NOT!!. Anyway, back on track. At one point. St. Monica had a vision of Our Lady, who appeared to her wearing mourning clothes with a shining cincture (belt). Our Lady gave the cincture to St. Monica as a sign of her motherly consolation and commiseration, who passed it on to the wayward Augustine. St. Augustine later gave it to his community, who wore cinctures as a sign of their devotion to Our Lady under the title Our Mother of Consolation. What is now known as the Augustinian Rosary is an offshoot of this particular devotion to Our Mother of Consolation. The "regular rosary" is a way of requesting Our Lady's intercession as we meditate on events in the life of Jesus. The Augustinian Rosary is a way of asking for the intercession of Our Lady in her role as Mother of Consolation via meditating on the Apostles Creed. The rosary is designed with thirteen pairs of beads. Two additional beads (on which one prays an Our Father and a Hail Mary for the intentions of the pope) and a medal of Our Lady of Consolation appear at the bottom. 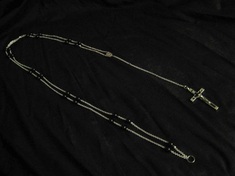 The very long version of this rosary (also has a crucifix at the bottom) that you see at the top of this post is from an Augustinian religious habit. Usually, for lay people, these will be made as small chaplets with the same bead configuration I mentioned. And so, I feel soothed. :) I do not own one of these particular chaplets, but I so enjoyed the story of St. Monica praying to Our Lady for the conversion of her son's heart. I pray the same not only for my son, but for all of my children and Godchildren. That they may always stay close to Christ and His Church. And may St. Monica and St. Augustine intercede to Our Lord for me in this request. And you, Jane! So grateful to have you here. :) I prayed for your intentions again yesterday on my way home. The agustianians you linked to arent Roman Catholic. They are independent Catholic and support gay marriage. Wasnt sure if you were aware. Delta, I am much obliged. :) No, I didn't see that until you pointed it out, and THANK YOU for doing so! I removed the link to the order itself, but I kept the link to the prayers in with a caveat since theirs is unfortunately one of only two sites that actually lists the prayers, and the other site isn't a Catholic order either. But I'm grateful to have that clarification in there now. A headcovering linkup? I'm there!